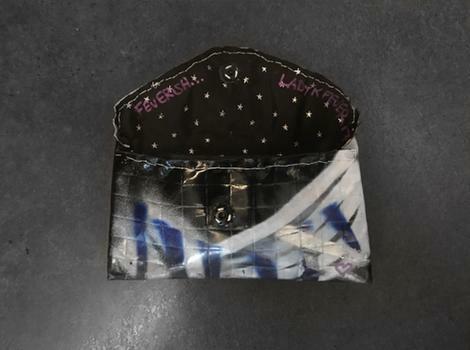 Created by pioneer graffiti artist, Lady K. Fever, FEVERiSH repurposes industrial reflective safety wear and graffiti art (both traditionally male dominated spheres) into a feminine fashion statement. Each series of hand bags and matching accessories begins on her studio walls as a diptych painting. The canvases are painted together and then separated: one canvas is saved as a painting. The other one is cut into pieces to be assembled and repurposed into art bags. Lady K-Fever (b. Canada) is a New York City based inter-disciplinary artist working with painting, installation, photography, performance/intervention and public art projects. Her work has been exhibited with New York City Parks Dept., D.O.T Art Community commissions, Art in Odd places, Tedx CUNY: Access Art, The Bronx Museum, MoMA, El Museo del Barrio, Longwood Art gallery, Intermedia Arts and featured in the New York Times, New York Post, Daily News and in the magazines: Studio (Harlem), Mass Appeal (Brooklyn), Backspin (Germany), and Trace (international) among others, and in the books Graffiti Women: Street Art from Five Continents, and Burning New York: Graffiti NYC, and We B Girlz (New York). In 2014, she founded The Bronx Graffiti Art Gallery, a public art project that aims to preserve graffiti art and culture in New York City. As a graffiti artist, she began writing her name in the streets of Vancouver in the early 1990s. Lady K Fever is the first Canadian woman to be invited to paint The Graffiti Hall of Fame in East Harlem, New York and to be put down with legendary New York graffiti crews: TDS, IBM, TDC and Vice President of TPT. She has painted all over North America over the past 25 years—incorporating traditional graffiti lettering, her flora and botanicals defining a signature abstract expressive style.